Ok friends, have you ever had a situation happen where for about 2 minutes you FREAKED OUT inside, ran through every scenario on how in the world you could fix something and then pulled yourself together and made it happen? Welcome to the world of wedding photography! This Louisville Regency Wedding was one for the books and you guys, we had more than one freak out moment; and one that was a complete first for us!! Before I begin, let me first just say that Sydney and Devin’s day was absolutely GORGEOUS. The people, their character and attitudes, the Regency venue, the colors, the way they love each other… I loved every single aspect and can’t think of a better way to end our summer season before fall begins next week. I specifically asked Syd’s mom if I could share a bit of our behind the scenes, because honestly it’s just refreshing you all! Other brides can learn from it and I think it’s SUCH a good reminder that at the end of the day, YOU ARE MARRIED and NOTHING ELSE MATTERS!! Now, what in the world am I referring to when I say freak out moment? Well, friends. It wasn’t the rain, although it poured all day with multiple tornado warnings in the surrounding counties. It wasn’t the fact that 3 different cakes had to be picked up and worked on, as one was dropped, one slid in a car and one was neon pink (shout out to Texas Roadhouse for saving the day on that on the final decoration!) Nope- not even that phased me…. the part where I was briefly scared? That would be when I went to the fridge and pulled out the flowers to start detail pictures and they were all brown. As in BROWN. DEAD. 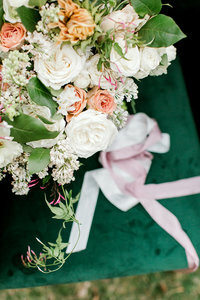 MUSHY MOLDY…… Did I mention WHITE Hydrangeas and BLUSH roses were brown?! (Check out the behind the scenes at the very bottom of this post.) You guys- I have never been more caught off guard on a wedding day! Turns out the fridge was a bit too cold and they were actually freezing. The water around the stems were frozen. ***Please note, I truly don’t believe this was anyone’s fault. The venue was so accommodating letting them stay over night and the florist did a beautiful job… it was simply an accident that couldn’t be anticipated! *** Sydney’s aunt Rebecca jumped in and found a florist close by. I told her what type of flowers to get and off the cousin’s went to pick up long stems that they had in stock. So y’all, I ended up making the bride’s bouquet! Literally an hour before we gave it to Sydney it was in complete individual stem pieces. The greenery was spared and everything else pieced back together. You just never know what will happen on wedding days! And guess what, Sydney didn’t even know it happened!! I tried to hard not to make eye contact when she was so sweetly and correctly explaining that the pins go to your belly button as you hold them. Shew, the morning was seriously a blur, but I can honestly say I got to witness some of the most tender and fun people genuinely celebrating last weekend. Devin and Sydney, thank you. Thank you for being so fun, so genuine and so laid back all at the same time! We hope you enjoy just a few of our favorites as you soak in this first week of marriage! Sweet first looks with her step dad. Their faces say it all! I always tell my brides, I will do as much as YOU are up for. We come prepared for rainy days! Clear umbrellas, protection for our gear, rain boots… we will trudge through mud to get the shot for you! It was steadily raining in all of these shots outdoors, but we’re able to shoot in a way that keeps the feel but minimizes the rain. If you haven’t been to Oxmoor Country Club, since The Regency Louisville took over their event space, just wait until you see what they’ve done. It’s absolutely gorgeous and in my opinion SO much better suited for weddings!! The staff was lovely to work with and despite a few of the morning glitches, very accommodating and quick to help fix a situation. Click this link if you want to see a little video of our flower escapades! And because I seriously can’t stop laughing at the memory of him chasing around the umbrella’s as they blew away… cheers to my love for always being the behind the scenes wonder on wedding days! He shoots and also holds all the things we we’re in a pinch. To the vendors who made this day absolutely gorgeous inside and out, thank you! You make our job so easy! THESE ARE SO AMAZING!! thank you so much for all of your hard work to make my day perfect! So much love for everyone involved! You’re so welcome, girl! We fell in love with your friends and family too. Such a fun day! Absolutely beautiful!! Thank you for all you did!!! I’m glad you love them, Lori!! We had such a great time with you all! I was a guest at the Karr wedding this weekend and I must say I am very impressed. The photography is beautiful. The way you served people was special. I witnessed you mopping up spilled drinks on the dance floor with a smile, the other photographer opening doors for guests and bringing drinks to the bridal party. Both of your demeanor was pleasant. If only we had been treated that way at my own children’s weddings. I hope they saw and tipped you well. Job well done indeed! Ah! This is wonderful! You and Paul are such a dream team. Sounds like a great bridal party and family to help out as well. I just love everything that you all do. Beautiful photos. Always! Ooooo, thank you sweet friend! I still think fondly back on your own wedding day. It was a great crew and lovely day this past weekend! I hope you’re doing well!! You did such a beautiful job on the Bride’s bouquet. The couple is so lucky to have you. Seriously way above and beyond for any Wedding Photographer. I love your images and the way you captured this Louisville Regency Wedding. They are so bright, joyful and sharp! you proved you can have a gorgeous rainy wedding day! these louisville regency wedding photos are so beautiful! Everything is beautiful. I love all the details my favorite is umbrella!! !